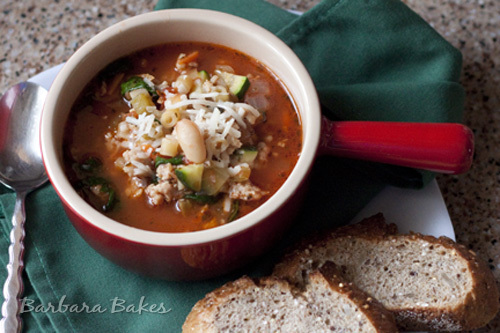 A hearty Italian soup loaded with sausage, beans, pasta, and veggies. It’s a one pot meal that’s quick and easy to make. I’m a little addicted to the Pasta Fagioli soup at Toscano Italian Bistro. I went on a quest to find a great recipe so I could make it at home. I found a wonderful recipe that is similar at Fake Ginger. The Pasta Fagioli at the restaurant doesn’t include sausage, but it sounded like a great addition. I used a ground chicken sausage from Harmons. I also decided to up the veggies and added a zucchini and some spinach at the end of the cooking time. 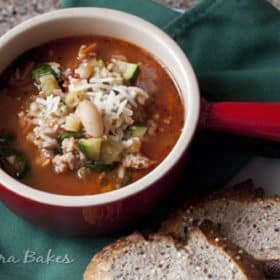 This soup was a hit with my family, and it’s going to make a regular appearance at our dinner table. Come join SoupaPalooza at TidyMom and Dine & Dish sponsored by KitchenAid, Red Star Yeast and Le Creuset. Heat olive oil in a large pot over medium high heat. Sauté onion about 2 minutes until it begins to soften. Add celery and carrots and cook, stirring frequently, for another 3 minutes. Add garlic and cook just until fragrant, about 30 seconds. Add the sausage to the pot and cook until the sausage is no longer pink, crumbling it as it cooks. Stir in Italian seasoning, red pepper flakes, tomatoes and chicken broth. Stir in the beans and pasta. (Add an extra cup of stock or water if it’s boiled down too much.) Simmer for 6- 8 minutes or until pasta is almost tender. Add zucchini and spinach and cook until zucchini is tender and spinach is wilted. Serve piping hot with Parmesan cheese. I have been looking for some new italian recipe and landed on your blog 🙂 Can’t wait to try this! This is one of my favorite soups, so perfect for this time of year. Hi Theresa – thanks for taking the time to let me know how much you liked the soup. So nice that it reminded you of the one your mom made growing up. I love one pot dishes, this looks so comforting!!! One of my favorite soups. So comforting and flavorful. Looks so warm and comforting! I was thinking about making a soup tonight since we had a big snow storm yesterday! 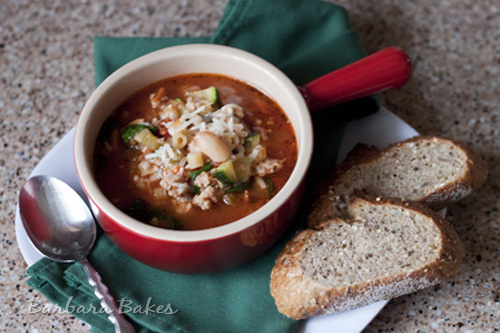 pasta fagioli is one of my favorite soups of all time. i make a homemade version, too! i love that there are so many different versions + twists on it. looks awesome! Your soup looks fantastic Barbara! Soup is still my favorite cold weather food, so I’m bookmarking to try soon. Yum 🙂 I’ve never had pasta fagioli ~ Thanks for sharing this recipe! Hope I get to make it soon! Looks homey and comforting! Love it! This is one of Ben’s favorite soups!